Do you remember the first time you ate such vegan staples as brown rice, tofu, and soymilk? If you memory goes back that far, the chances are it was in the late 1960s or early 1970s, as the famous counterculture of those days was moving with the flow beyond the Summer of Love and acid to permanently affect the lifestyle of millions, and nowhere was this impact felt more strongly than in the way we eat. Before, food was centered in white bread, cow's milk, meat and potatoes, alongside a modest serving of canned or overcooked vegetables. After a revolution as dynamic in its own way as the great civil rights and anti-war campaigns of those days, the keywords were natural and organic, locally sourced, and if not strictly vegetarian or vegan, close to it; the enemy was the great food conglomerates with their factory farms and their highly processed, additive-enriched "plastic"foods. As Kauffman says early on, in those days eating brown rice was a political act. 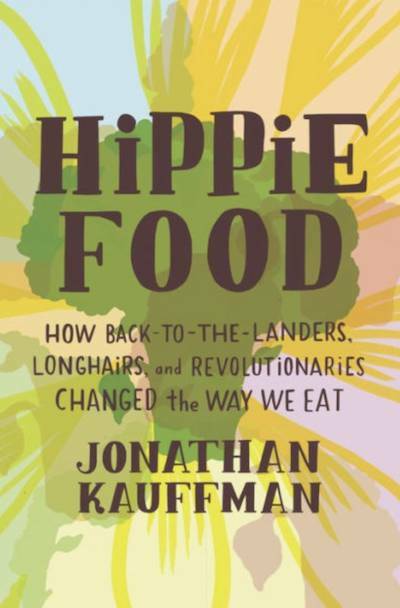 Kauffman's Hippie Food tells the story of these politics. While the new wave may not as yet have taken the field with total success, it has certainly made a difference, as a glance at the shelves of any supermarket will relate. The same is also true of the rather ironic tribute paid by the demonized food giants as they bought up or reproduced edibles like granola or tofu "meats," and saw to it we had access to bean sprouts and hummus. How did we get there? The major chapters of this book trace the influence of George Ohsawa and "macrobiotics," which, whatever one think of its division of food into yin and yang substances, promoted vegetarianism (with occasional exceptions), "natural" preparation, and the importance of whole grains. Frances Moore Lappé (incidentally a graduate of Quaker Earlham College) and her 1971 Diet for a Small Planet was immensely change-making by inculcating the simple idea that world famine, so loudly proclaimed by doom-sayers of the era, would not arrive because of a real shortage of all food, but by poor distribution, above all by the highly disproportionate and wasteful consumption of grains, not directly by humans but by livestock. There were the examples of back-to-the-land vegetarian communes like Stephen Gaskin's The Farm, moved from California to Tennessee. Samuel Kayman, influenced by Rachel Carson's 1962 Silent Spring, pioneered and published about new-wave organic farming in New Hampshire. By the early 1970s, at their peak over a hundred countercultural agricultural communes dotted the landscape. Then there were the famous restaurants like the New Riverside Cafe in Minneapolis and the Moosewood in Ithaca, NY, bringing then often-unfamiliar foods like sprouts, tofu, brown rice, whole-grain bread, and organic everything to the masses, while often producing resources like the popular Moosewood Cookbook, or inspiring a manual like The Whole Earth Catalog, found in some corner of virtually every hippie or "with it" household. To be sure, much of this was not truly new in the 1960s, as earlier reviews in The Peaceable Table of histories of vegetarianism have pointed out, and as the author of Hippie Food acknowledges. In the nineteenth century Sylvester Graham, inventor of the now much-debased graham cracker, vociferously promoted simple, whole-grain food, and John Harvey Kellogg, who invented granola and corn flakes, inspired the Seventh-Day Adventists who carried the vegetarian message through their churches and hospitals to innumerable American cities and town. So did other progressive individuals and organizations, and the fortunes of the cause waxed and waned and waxed again in the now-legendary Sixties. Nonetheless, Kauffman (pictured) is entirely right in thinking that something really new happened then as well, and it is that happening, and the others only indirectly, that brought us to where we are today. Not only did the hippies cause the new foodism to break out of restricted religious or cultural enclaves to appear in restaurants and supermarket shelves everywhere, they made it part of a whole new mentality that swept across the land, despite holdouts. Without ever quite saying so, brown rice and sprouts were at one with being feminist, anti-war, anti-segregation, and meditating. So it is still. More and more (though not yet everywhere or for everyone), being vegetarian or vegan is "cool" rather than something for which to apologize. It is worth mentioning, especially in light of current events, that as with many "culture war" victories, the food change came very little through explicit legislation unless after the fact, and far more by changes in mentality. When change is upon us, what was once accepted (like smoking or closeting homosexuals or explicitly restricting roles for women) just gets fewer and fewer thumbs up from aware people, who find themselves thinking and living differently as the time for the new rolls in. Often businesses, who know where their customers are at, like cookbook publishers, restaurants, and supermarkets in this case, are way ahead of courts and legislatures in making the change visible, and pave the way for timid politicians to follow when the highways are safe. If you want to know more about how it happened then, and is still happening, read Hippie Food. Highly recommended as a well-written, entertaining read, and giving information every food activist should have.